DIY - Inspiration to learn, make, share and for more: During the past years a strong maker community emerged around the globe in which people like to work with soldering irons, saws and cordless screwdrivers as much as with 3D printers, laser cutters and 3D scanners. Make: magazine publishes creative DIY projects including the necessary construction instructions for both beginners and advanced users. 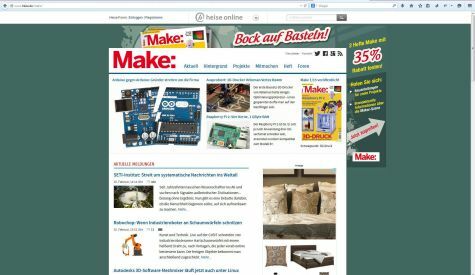 Its articles are about Arduino, Raspberry Pi and other electronic devices, but also about projects that have nothing to do with computers and electronics such as upcycling ceramics, water rockets, biohacking or textile printing. Make: shows its readers how projects work, provides both regular portraits about DIY experts and basic articles about topics like CAD, metal processing or programming and presents the work style of well-known manufacturers and service providers. Tests provide information about the most appropriate DIY accessories such as 3D printers, oscilloscopes or soldering irons.